Osteoporosis literally means 'porous bones' and is a condition where bones gradually become brittle and fragile, leading to an increased risk of fracture, from sometimes something as simple as lifting a heavy bag. It is a debilitating bone disease that eventually weakens the whole skeleton. The bones in the wrist, hip and spine are the most likely to suffer fractures and can be extremely painful. Women are at greater risk of fracture due to reduction in oestrogen during menopause. This hormone is important in maintaining healthy bones but during menopause its levels decline and bones lose their calcium and other minerals at a much faster rate. 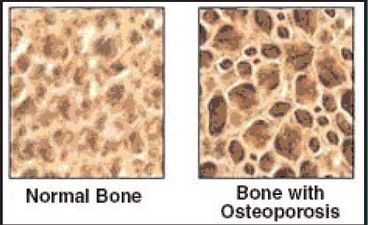 One third of Caucasian women over the age of 50 have osteoporosis, yet nearly 80% remain undiagnosed. After menopause, a woman's risk of suffering an osteoporotic spine or femur fracture is 30% or three times that of a man's. There are also several other risk factors including family history, certain medications and medical conditions. What is happening to my bones? Bone is a living tissue and your skeleton is continually growing from birth to late teens. Your bones reach maximum strength and size in early adulthood where calcium and other minerals have reached the peak of deposits. Bone continues to be broken down and renewed throughout your life. Osteoporosis is a complex disease that may progress silently for decades - there may be no symptoms until fractures occur. Bone loss is the major risk factor that can be modified in mid-life to reduce fracture risk. Bone loss can be reduced by treatment, but it is difficult to restore the microarchitecture of the skeleton once bone has been lost. Early detection and intervention are crucial. Calcium makes your bones hard and strong but the body also requires calcium to maintain healthy cells and so withdraws calcium and other minerals from the bone into the blood for use elsewhere in the body. After early adulthood the body starts to withdraw calcium and other minerals faster than it is depositing them, gradually causing your bones to thin. If left untreated the bones become fragile. brittle and prone to fracture. The GOOD NEWS is that Osteoporosis can be prevented by following a few easy steps.